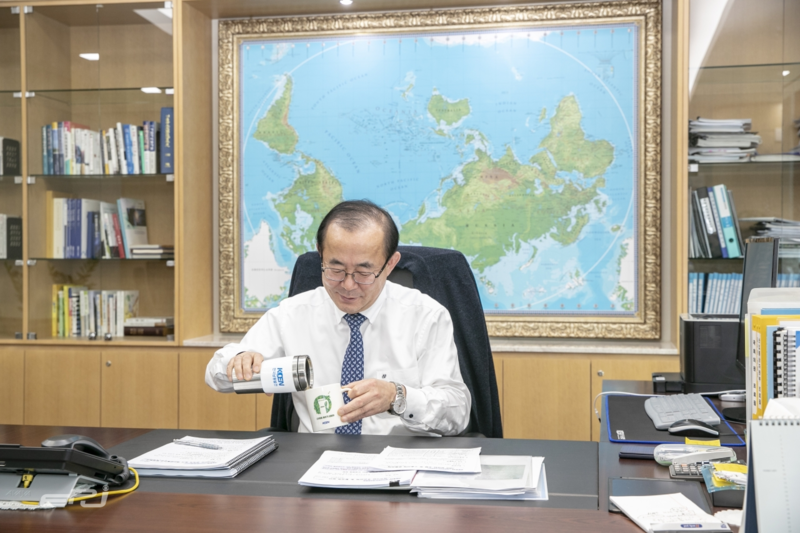 KOEN President Lyu Hyang-yeol uses a temblor as part of his efforts to reduce the use of plastic. Korea South-East Power Co. (KOEN) is working on a variety of projects to expand its presence in the new and renewable energy segments. One of KOEN’s representative projects in the sector is the dedication of the Gunsan Water Photovoltaic Power Plant last October. KOEN, the first Korean company to venture into the commercial off-shore photovoltaic power segment, is considered to have turned the Tamla Off-shore Photovoltaic Power Plant in Jeju into a successful model. The Gunsan Water Photovoltaic Power Plant, built at a detention basin area covering 204,094 sq. meters in the 2nd Gunsan National Industrial complex, is the largest-ever water photovoltaic power facility in Korea. The photovoltaic power facility has a capacity of 25,322MWh and was dedicated last July after five months of construction. It is capable of producing electricity about 7,450 households consume. It is noteworthy that the project is done over the surface of water of an idle detention basin near a wastewater treatment facility, a practice that overcomes a shortage of land vailable for the construction of such photovoltaic plants. A KOEN official said construction of a photovoltaic power plant using water - while retaining the function of the waste water treatment facility - was an example of efficient use of land. It is also noted for fully protecting neighborhood residents’ environment rights, he added. The Tamla Off-shore Photovoltaic Power Plant in Jeju was dedicated in November 2017 as the nation’s first off-shore photovoltaic power facility for commercial use. 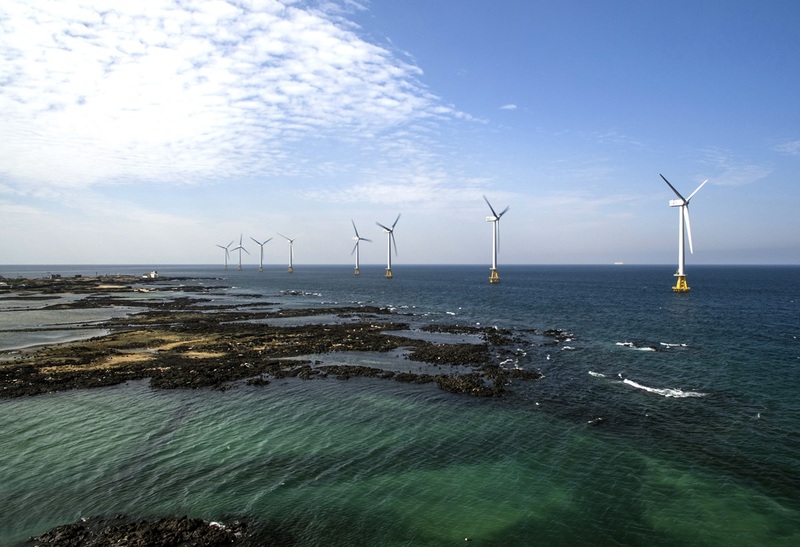 The facility, built at an off-shore area in Geumdung-ri and Dumori, Hangyeong-myeon, Jeju City, has a capacity of 30MW (10X3MW units), accounting for 2.5 percent of Jeju’s total electricity production. The facility is capable of producing 85,000MWh annually, which is enough power for 24,000 households in Jeju. Utilization of the facility stands at about 80 percent during the period between September and next April. KOEN succeeded in introducing a photovoltaic power system that also makes farming compatible in June 2017. The power company installed a 100KW photovoltaic power facility on a lot covering 6,600 sq. meters. The system allows rice farming on its lower layer and power generation on its upper part. So far, shade plants have been grown under the lower part of photovoltaic power facilities. It is the first time rice farming is allowed under such photovoltaic power plants. KOEN has already declared the new vision “2025” of raising the portion of new and renewal power generation in the power generation portfolio from current 2 percent to 25 percent by 2020. The plan is more aggressive than the government’s “3020” goal of raising the percentage of new and renewable power generation to 20 percent by 2030. To this end, KOEN President Lyu Hyang-yeol said in an interview KOEN will invest a combined 25 trillion won to raise the portion of new and renewal power generation in the power generation portfolio from current 2 percent to 25 percent. “Our nation’s territory is narrow, but conditions for wind power generation on land are not quite good,” President Lyu was quoted as saying. The nation, surrounded by three seas, has better conditions to generate off-shore power, he noted. Currently, KOEN has a power generation portfolio in which 89 percent of power generation depends on thermal power, followed by LNG with a 9 percent share and new & renewable energy with a 2 percent portion. In the past, because of cheaper, good quality power generation, coal-fired power generation was a mainstay business, but a clean, safe power generation has become a global trend in the wake of the Paris deal on climate change, Lyu said. KOEN plans to expand LNG and new/renewable energy power generation as a future growth engine, he added.